Love at first bite. 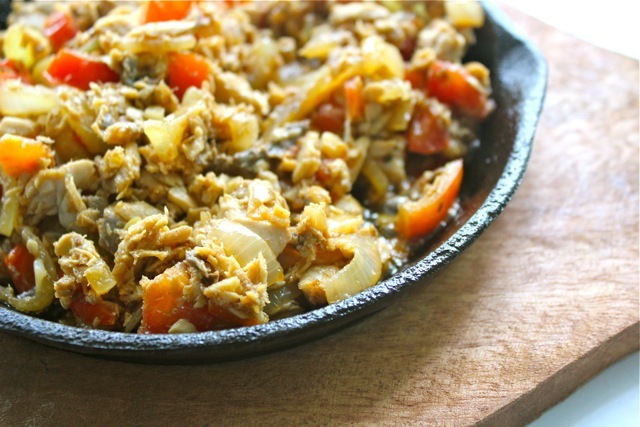 If you are like me, and love the flavor combination of soy sauce and kalamansi or kikkoman and lemon (a U.S. college era thing), onions and tomatoes sauteed in some lard and flaked boneless bangus, then you might consider trying this dish. 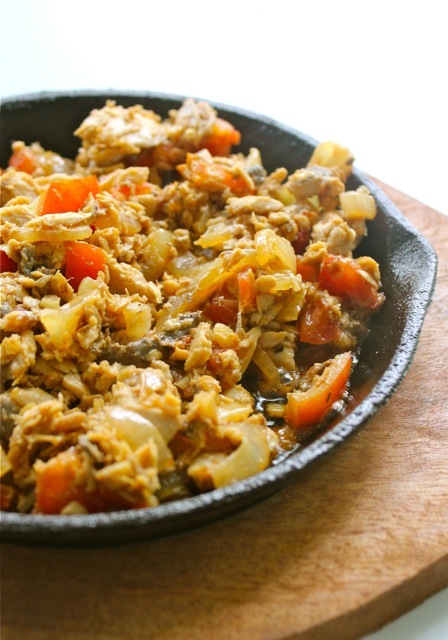 The ingredients are slightly crisped on the one side, soft elsewhere, similar to what others might call bangus sisig perhaps. An offshoot from an earlier experiment with rellenong bangus, here, I decided to try this on a sizzling plate, and the results were, for me, absolutely delicious! A sizzling plate of bangus sisig sauteed in lard	is what I need to ward off this bitter bone chilling cold! O Pinas! I should have been there by now. Thanks! this looks easy enough for me to try. We did the banana cake Saveur recipe the other day and it was very nice and moist. Will this fish recipe work on other types of fish? I can’t think of any which has the same type of “firm” texture as bangus. Gigi, maybe tuna might work? oh my! am salivating!! will try to do this one when I come home next week. Pinas, here I come! Kagigising ko lang at ito agad ang nakita ko… ayyyyy…mga kumpadre, pwede din ito sa breakfast with sinangag… kasabay ng mainit na chokolate o kaya kape barako. O ano sister ConnieC, sunduin mo na si BettyQ at pumunta tayo sa bahay ni MM at kumain tayo nito. Halina…	Parini ka na at baka ubusan tayo ni Footloose at Lee. Great idea on my way to buy boneless bangus. Do you mean to discard the head of the bangus? MM, looks so yummy and so easy to make! I’ll try this this weekend! I think any firm fleshed fish will work…cod, halibut, snapper, or any rock bottom fish…even salmon will work….poach the fish fillets first and proceed as above! Getter DRagon 1… was it you who like the Korean Sweet Potatoes? if it is you, there I think you will be pleased that you can get EXACTLY the same product you buy from them old guy using my method and the oven…Get or buy small korean sweet potatoes so they will roast faster and all at the same time wash them well and pat dry. Crank your oven to 500 degrees and put 1 rack on the bottom shelf just above the heating element. Now space your sweet potatoes directly all over the rack…no cookie sheet needed. After say 15 minutes, check your sweet potatoes, the skin should be gettting wrinkled and the bottom should change color from purple red to brownish black. Turn down the oven temp. to 400 degrees. Flip them over and roast for another 10 to 15 minutes and touch one and check if they are soft. remember they are small so by this time, they should be getting done. When you tke them out of the oven, put the sweet potatoes in a brown paperbag, close it and leave them in there till cool enough to handle…The skin could be peeled easily and and the flesh will have that caramelized spots EXACTLY like the ones you buy and with a smoky undertone. No need to prick the potatoes before roasting. As long as you keep an eye on them and not over roast them, it will not explode and make a mess. I think you will no longer buy from the old guy. This is called Sisig na Bangus in this neck of the woods, minus the sizzling plate. I doubt that they use lard though. Looks delish!!! Haven’t had bangus for over a year now (no milk fish in this country :( sniff), so i can’t wait to fly home and try and make this. just a few months more! nom nom! Ms BettyQ, try ko ito, kaya lang walang bottom heating element ang stove ko, flat lang siya. Gng. Ebba…basta ang rack ay naroon as pinakamababang baitang sa iyong oven, uubra na maluto iyong mga camote na lasang katulad ng binibili ko saKorean store. Pero bago mo kainin, hintayin mo mapasingawan ang balat as loob ng paper bag para madali balatan at .mahalimuyak. Naubos na namin ang 3kg.na Korean camote na niluto ko moong miyerkules. Bibili ulit ko ng 3 kg. na maliliit na Korean camote pagluwas ko mamaya. Ebba…ilalagy ko ang e mail mo sa aking iPad contact sa face time at ganoon din ang gawin mo sa iyong iPad para tayo mkapag chismisan sa face time. Binibining BettyQ, ipagpaumanhin ninyo po, wala akong Ipad, hahhaha. Skype na lang tayo. Ano ba ang time difference natin? Meron akong nabili kanina Hawaian Kamote. Maputi-puti ang balat, ube ang loob. Ito ang mga binibili ng mga Pinoy rito, kasi mas maganda ang kalidad; kasing sarap ng kamote natin, matamis at hindi mayabo. Grrrrrrrrr, naglalaway naman ako nito. Ang sarap tingnan, at siguradong sigurado ako na mas masarap ito kainin!!! @ Fish Accord, yup, that’s why they call it BONELESS, SKINLESS chicken breasts where the most common or popular use of Enlgish is being spoken. (like Australians has to speak in a more American accent when teaching English). It is understood that it’s been deboned and not literally boneless chicken. No 20th or 21st century songs would be a hit if they were penned by gramarrians. Oh that would’ve been a very boring world, I might say.